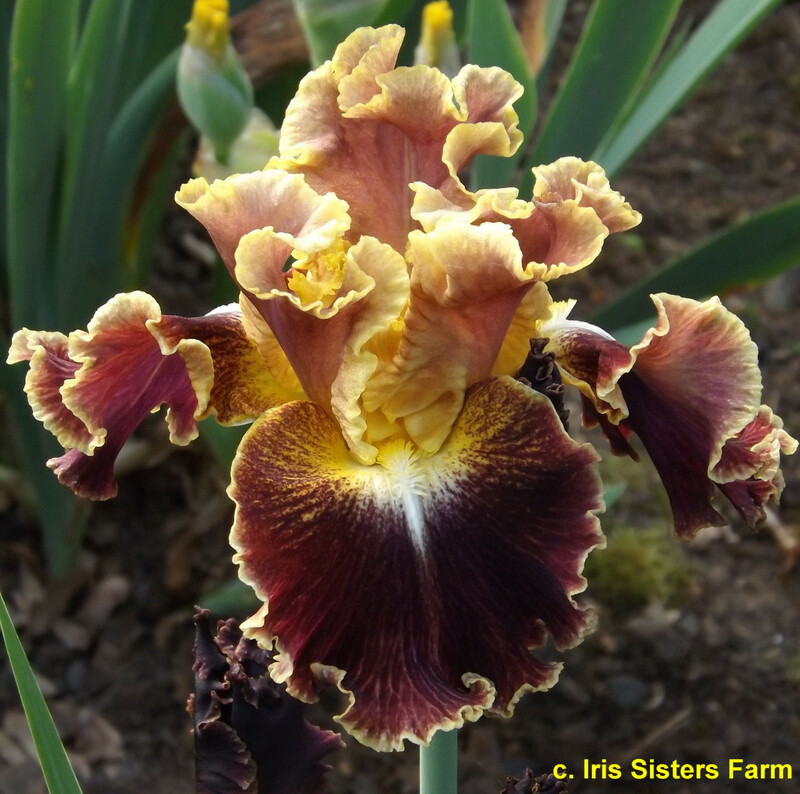 'Volcanic Glow' (Keith Keppel, R. 2011) Seedling 05-78B. TB, 36" (91 cm), Midseason bloom. Standards aureolin (M&P 10-L-2), central area flushed cedarwood (6-G-10); style arms aureolin, slight cedarwood flush; falls zanzibar red (8-L-5), velvety wash, narrow aureolin edge; white heart and dart below beard, heart edged bright golden lemon (9-L-2/3); beards white base, tips golden lemon; luminata. 'Montmartre' X 'Lip Service'. Keppel 2012, Honorable Mention 2014. Hybridizer's comment: All that's missing is the smell of brimstone ! Smoky, smouldering hot luminata, with aureolin yellow standards flushed brownish red in the central portion. Zanzibar red falls, with a velvety wash overall, carry a narrow aureolin edge, while the white hot heart is edged bright golden lemon. Beards are also golden lemon. Ruffled, with terminal and three branches, up to eight buds. jpg VOLCANICGLOW4.jpg manage 316 K 12 Dec 2018 - 16:15 Main.TLaurin Photo by Stout Gardens at Dancingtree. JPG VolcanicGlow02.JPG manage 136 K 15 Mar 2016 - 22:08 Main.TLaurin Photo by Tara Perrenial Farm-Owen Sound,Ont.